Magenta space Hitler is go! Burn like his power... Sinestro's might!" Following his defeat in Green Lantern: Rebirth, Sinestro has retreated back to Qward, where he has taken over and started to amass an army of Yellow Lanterns capable of "instilling great fear." Modeling his army after the Green Lantern Corps and allying himself with the Anti-Monitor, he launches an all out war against the Green Lanterns. The story entered production in 2006 and was released following the Sinestro Corps Special in June 2007. It proved to be a massive success, financially and critically. Fans consider it among the best Green Lantern stories and it is easy to see why. It introduced new storyline concepts including the variously colored Lantern Corps and the emotional spectrum. Anthropomorphic Personification: It's established that "Ion" is actually the embodiment of willpower, just as Parallax is the embodiment of fear. The rest of the emotional spectrum weren't covered for some time. An Arm and a Leg: When Risk attempts to take revenge of Superman-Prime for tearing off his arm during Infinite Crisis, Superman-Prime responds by tearing off his left arm. Ascended Extra: Many of the Sinestro Corps members. An example? Low and Maash have their own action figures now. "Who are Low and Maash?" you ask? They appear in the background of a few scenes. As Long as There is Evil: Sinestro makes this boast while he, Hal, and Kyle fight. Sinestro: As long as there is life, the universe will never be without fear! Bad Guys Do the Dirty Work: Just like Crisis on Infinite Earths, everything the heroes throw at the Anti-Monitor won't bring him down until the Anti-Monitor's OWN TEAMMATE Superboy-Prime disposes of him in revenge for the death of his Earth. Beat Them at Their Own Game: John forms a sniper rifle construct to take on Bedovian. Breakout Character: The Green Lantern franchise as a whole, in the larger DC universe. Most directly, Sinestro Corps' success got its sequel Blackest Night expanded from a Bat Family Crossover to a full-blown Crisis Crossover. 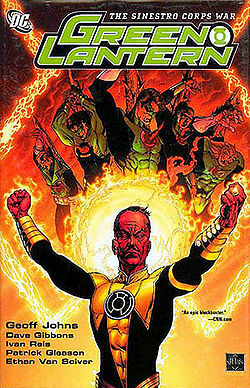 The series also cemented Sinestro as one of the top villains in the DCU. Bring It: After Hal, Kyle and Sinestro have all had their rings drained and end up on a rooftop, Sinestro just glares at them. "Come on, then. The both of you." C-List Fodder: Particularly Jack T. Chance, who Geoff Johns admits was killed for being "Guy Gardner-lite". John: That'd take the grenade the size of a moon. Guy: Hey, Johnny Boy... [points to Warworld] ...what do ya think that is? Color-Coded for Your Convenience: Obviously, but subverted by Parallax, who wears green while possessing Kyle. Combat Breakdown: Sinestro vs. Hal and Kyle, after all three get their rings drained. The Dead Have Names: During the epilogue, Vath insists on reciting the names of every Lantern killed in action. Death Seeker: Henshaw / Cyborg-Superman, who only works for the Anti-Monitor because it's promised to kill him once and for all. Unwanted Revival: He almost gets his wish, but is revived by his Manhunters at the very end. He cries. Demonic Possession: Parallax does this to Kyle, and the resulting monstrosity later absorbs Hal as well. This backfires: neither of them could beat him individually, but together they fight their way out from the inside. Despair Event Horizon: Coast City was already suffering from morale problems after being destroyed in The Death of Superman, and Sinestro intended to hit the event horizon by razing it again. Averted when the people support the Green Lanterns and refuse to evacuate. Did You Just Punch Out Cthulhu? : Hannu PUNCHES The Anti-Monitor. Dirty Coward: Once the amendment to allow Green Lanterns to use lethal force is effected, Amon Sur flees the battle. Dragon with an Agenda: Henshaw, who just wants to die, and Superboy-Prime, who wants revenge for losing his Earth. The Earth-Prime Theory: The Sinestros don't want the center of the universe, they want the center of the multiverse. Foreshadowing: When the Guardians of the Universe decide to rewrite the Book of Oa, they tore out the "Blackest Night" prophecy. Ganthet and Sayd, fellow Guardians who objected to this and are thus kicked out, later explained the prophecy. Genius Loci: Mogo (sentient planet), Ranx (sentient space-faring mega-city). Godzilla Threshold: The threat from a rival Lantern Corps is so great that the Guardians decide to revoke Thou Shalt Not Kill. On a smaller note, Hannu lights up his ring against the Anti-Monitor, when he usually takes personal pride in never using the thing. Good Old Fisticuffs: It's established that Sinestro can handle himself well in a fist fight. Ring: Warning. Power levels approaching 0.0%. Sinestro (to Hal and Kyle): Come on, then. The both of you. Hero Killer: Superboy-Prime and the Anti-Monitor. When they arrive on Earth, the entire situation takes a turn for the horrible. Improbable Aiming Skills: Bedovian and John Stewart. I Take Offense to That Last One! : Amon Sur mocks Hal for being despised and abandoned by his Corps. Enter the Lost Lanterns (who hold a grudge against Hal / Parallax for leaving them for dead in space) to correct him. "Despised is one thing, but abandoned? That the Green Lantern Corps don't do." Legion of Doom: Sinestro, Parallax, Cyborg-Superman, Superboy-Prime, and the Anti-Monitor? ...Mother. Loads and Loads of Characters: This is DC, so of course, but there are tons and tons of Sinestro Corpsmen with distinct appearances, names, and backgrounds who really only appear for a page or two. Mass "Oh, Crap! ": Sinestro Corpsmen realizing that the Greens are now allowed to use lethal force against them. Monumental Damage: The Sinestro Corps destroy the Statue of Liberty and, somehow, replace it with a statue of their leader while they're busy invading Earth. Kyle and Guy fix it during the epilogue. Averted with the bit at Mount Rushmore, as the mountain doesn't take any damage. Nice Job Fixing It, Villain! : When Superboy-Prime does away with the Anti-Monitor, allowing Nekron to claim the body. Oh, Crap! : Superboy Prime thinks that the 'stupid light' inside a Guardian of the Universe is how they bleed. He screams in fear when he realizes that no, it's how they die, and he's at ground-zero for the effect. Earlier Prime regains his power when the Sunlight reaches him, causing every hero to go: OH CRAP! Omnicidal Neutral: Superboy-Prime stops caring about sides, deciding he'd really rather just kill anything that moves. "I'll take EVERYONE! Both Corps! Bring it on!" Orcus on His Throne: Superboy-Prime sits on the Moon watching Earth for much of the Sinestro War. When he finally gets involved, he does whatever he wants including punking his own teammates. The only reason Sinestro picked Superboy-Prime as a teammate, plus two other Omnicidal Maniac, at all was that he knew they'd eventually try to kill each other but not before advancing their own plans by hurting their mutual enemies. Sodam Yat as Ion: Now where were we? Superboy-Prime: Ion, huh? you act tough, but you don't look so special to me. Psycho Rangers: The Sinestro Corps. A handful of Lanterns even have specific Evil Counterparts: Arkillo for Kilowog, Ranx for Mogo, Superboy-Prime for Sodam Yat, Enkafos for Salaak, even a guy called Romat-Ru for Tomar-Tu! Punched Across the Room: Most of the Superman fights had this, with everyone being punched across cities and whatnot. Retcon: Just like Rebirth established Hal Jordan and Parallax as two separate beings, Sinestro Corps reveals that Ion is an entity separate from Kyle Rayner. Sealed Evil in a Can: The Anti-Monitor becomes trapped in the Black Lantern Battery. Sealed Evil in a Six Pack: The fear entity Parallax is captured by the Guardians of the Universe and split into four pieces, each stored in the power batteries of the four Earth Lanterns. Sequel Hook: Before the climax, Ganthet and Sayd explain that more Lantern Corps will be emerging, and at the end they begin laying out the foundations for the Blue Corps. The Stinger: Another Hook: The Anti-Monitor's body is drawn to a dead planet and becomes the Black Lanterns' Power Battery. We also see black-ringed hands rising from graves, but that's just metaphorical. For now. Guy: You ever see "Red Dawn"? [makes constructs of] "Wolverines!" Also to the University of Michigan - said wolverines are wearing U of M armbands, and Guy's got a U of M sticker on his lantern battery. Plus during the fight on the US West Coast, Kilowog and Arkillo go through the San Diego Comic-Con. Hal refers to Lyssa Drax as the "Wicked Witch", and then uses his ring to create a house which he then drops on her. John calls the Anti Monitor Marshmallow Man before the Green Lantern Corps engages him. Space Whale: Ion's true form is a giant green whale. Start of Darkness: In retrospect, this war was one for the Guardians. The Sinestros and other emotion-powered Lantern Corps that emerged afterward terrified them so much that they started taking more extreme steps to fight them, until they tried to get rid of emotion altogether. They Died Because of You: Kyle's life was already the trope namer for "Women in Refrigerators", but now it turns out that the disease that killed his mother was a sentient virus who joined the Sinestro Corps. Sinestro lets him know this to weaken his mental defenses against Parallax. This Is Something He's Got to Do Himself: During the invasion of Earth, Salaak tells other Lanterns not to get involved in Kilowog vs. Arkillo. No longer enforced - rather than take it too far in the other direction, debates over proper use of this power continued being discussed within the Corps even after the war. Most Lanterns (including the human leads) make it a point to leave killing as a last resort. Notably, Kilowog considers an eagerness to kill to be a weakness, and defeats Arkillo handily while Arkillo's focusing on murdering bystanders. Henshaw punches Superman through the Statue of Liberty, snarling that he can't kill him. Superman calmly replies that he's never tried. Took a Level in Badass: Every GL still alive after the Battle of Mogo, but particularly a young Daxamite named Sodam Yat, who was a simple nobody until he was given the Ion Entity to increase his powers 100 fold (Oh and Daxamites have all the powers of Superman). Xanatos Gambit: Sinestro set things up so that no matter what the outcome was, he would win. Either he and his troops gained control of the Multiverse, or he forced the Green Lantern Corps into adopting more aggressive tactics that he feels would be more suitable to bringing order to the Universe.